Andrés Bayona, president AMGNV at AltFuels opening. 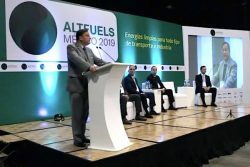 During the 2018 edition of AltFuels Mexico, the Mexican Association of NGV, CNG, LNG and Biogas (AMGNV) was officially launched. This year it stands as a major supporter of AltFuels Mexico 2019. The association estimates that more than 15 thousand vehicles converted to Natural Gas Vehicles (NGV) are already circulating in Mexico, made up of approximately 45% taxis, 15% passenger transport and 40% freight transport. The AMGNV is made up of more than 80 Mexican and foreign companies from the entire gas value and vehicle manufacturing chain. The objective of the AMGNV is to gather all the businesses of this booming ecosystem and support them by promoting public policies, fair operating rules, while offering security to investors and benefits to end users such as public and private carriers. Imminent and exponential growth of the sector is expected in the coming years, due to the global policies of energy transition that will allow multi-fuel service at filling stations, the increase in the offering of vehicles powered by alternative fuels, as well as the reserves of shale gas in Mexico. As is the case for all new fuels, the chicken or egg question arises about refueling infrastructure versus vehicle acquisitions. Seeking to overcome this, AMGNV will is promoting the opening of 3,000 Compressed Natural Gas (CNG) stations during the next 10 years in the country for an investment exceeding USD 150 million. “At present there are about 30 CNG stations, but there is an equal figure underway so we expect to close the year doubling the current scenario. To the extent that we double the stations and growth becomes exponential because there is a service network,” explained Andrés Bayona, president of the organization. AltFuels Iberia 2019, the next NGV event organised by AltFuels Communications Group, will be held at the IFEMA Trade Fair Center in Madrid. The event seeks to explore and strengthen economic ties among key decision makers, fostering high-level business meetings with the latest alternative fuel technology. Visit www.altfuelsiberia.com. AltFuels Iberia will host the mid-year meeting of NGV Global’s Board of Directors.